You’re in a formal setting like school or the office. Another student or coworker makes a racially disparaging comment. How do you respond? Jasmine Reign: First, think about how you can engage the people that are close to you to help you process how it made you feel. It’s important to name that feeling, to tell someone how it made you feel, and then heal from it. Even if it’s just saying that “a person at school said something wild to me today,” letting your friends and family weigh in with their own similar experiences, and then laughing about it — that’s a healing process. You get to choose what that looks like. If you do feel like engaging, then you have to name the thing that upsets you. 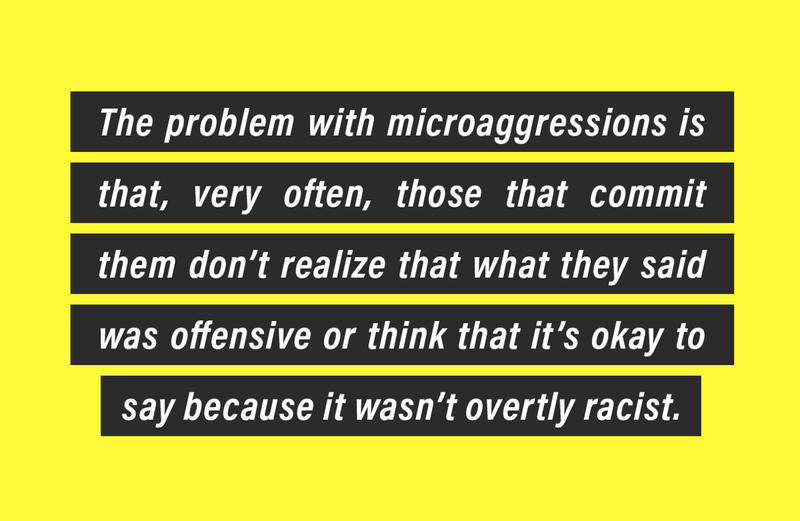 The problem with microaggresions is that, very often, those that commit them don’t realize that what they said was offensive or think that it’s okay to say because it wasn’t overtly racist. Deciding whether or not to speak up really depends on how safe you feel in the space. I think we’re always very quick to say “address it, stand up for yourself, do something,” because I think that that can be a bit naïve. If you are in a setting where you might be in physical danger or you are in emotional danger (as in you don’t have the means to address it without being upset or hurt), you have to consider the potential benefit of addressing the microaggression. If it feels like it will hurt you more to address something than to let it slide, that is valid. You aren’t any less #woke and your identity isn’t any less salient just because you didn’t correct or engage someone. It’s okay to decide that, for your safety, you don’t want to address it. What’s important is that you take the time to allow yourself to feel however you need to about it. Too often we’re told to brush things off, leave them alone, or just assume good intent; that’s how systemic racism became a thing in the first place. Don’t ignore your first impulse, but don’t stay there. Silence can make things seem far bigger than they are. Telling that person, “that’s not ok, because it made me feel unsafe” is very important. If they respond with aggression, you get to decide how you want to address that. You have the right to defend yourself however you like, but remember: what’s important here is a safety assessment. If someone has hate in their heart, they may lash out. If they seem open to hearing you out, assume good intent and explain why exactly what they said is not okay, and how it made you feel. 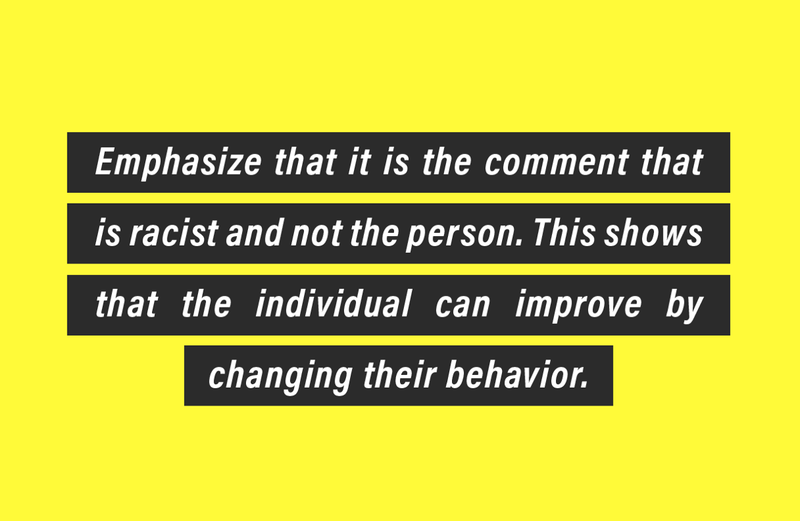 People respond to people a lot more often than they do to theoretical frameworks, so if you can say exactly how their words made you feel less than or unsafe, that can be a lot more effective than simply saying “that’s problematic,” without context. Jasmine Reign daylights as an advocate, trainer and activist working to end the commercial sexual exploitation and domestic trafficking of girls and young women, and moonlights as an electro-jazz musician. Martese Johnson: Here are three options for addressing microaggressions, that, when used together, can provide viable solutions to a large range of people in uncomfortable situations, helping to resolve issues of micro-aggressions or potential danger. Direct Confrontation: Depending on your level of comfortability, direct confrontation might be the method for you. I would advise a peaceful and calm approach that is not visibly angry or intimidating, but open and empathetic instead. While the person may have made a racially offensive comment, they may be unaware of their mistake, which usually seems to be the case. 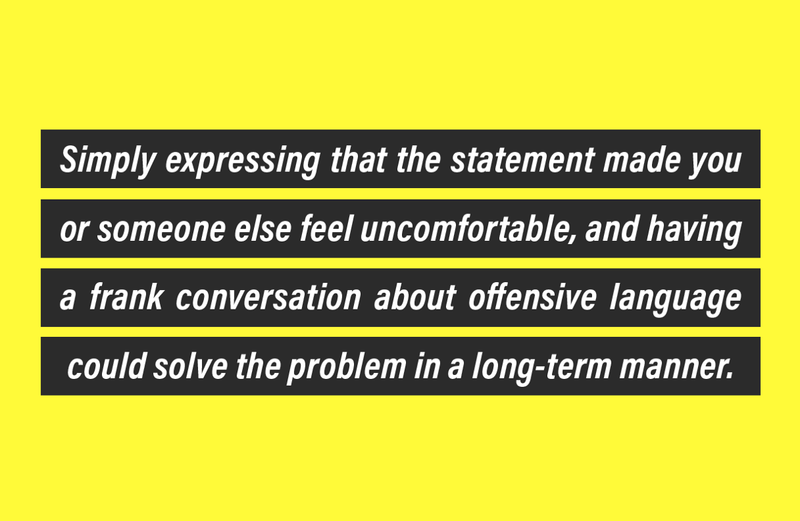 Simply expressing that the statement made you or someone else feel uncomfortable, and having a frank conversation about offensive language could solve the problem in a long-term manner. Delegation: If you are uncomfortable with the direct approach, delegation can be a useful tool in this scenario. Find a nearby peer or manager, and explain what happened. The goal may not be to take punitive actions on your coworker, but simply to have a manager address the issue directly or facilitate a larger office conversation where you can express your grievances without pointed language. Martese Johnson is a strategist, speaker, and advocate. You are chilling with friends when an acquaintance of yours says something racist. How would you respond? 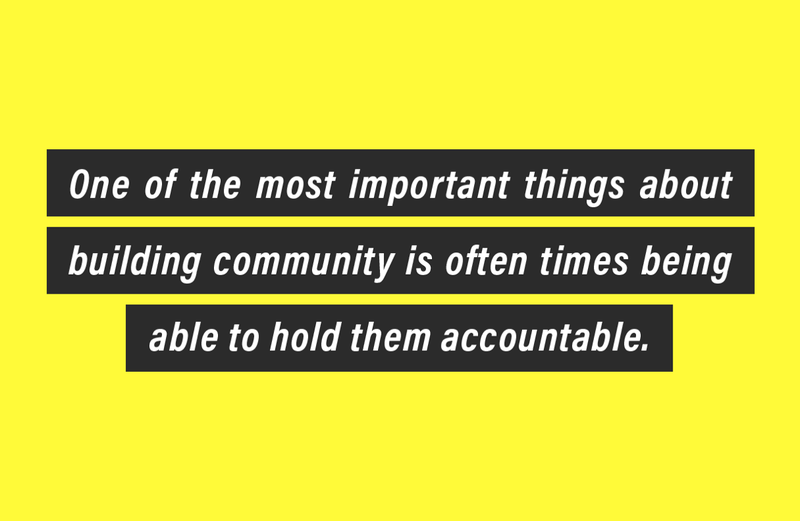 Daniel Leon-Davis: One of the most important things about building community is often times being able to hold them accountable. Of course, there are times when things will be said and the best reaction might be to step away, but if you are able to, I would encourage you to hold space for a conversation with your acquaintance or friend. If there is mutual respect from both parties, then these conversations can often times lead to a good result. One of the biggest things I find myself doing is breaking down generalizations and also showing the humanity of individuals. For a lot of my republican friends, I was their first undocumented person they met and that allowed me to breakdown that undocumented people are human too. We are all human. Daniel Leon-Davis’s work spans from helping create #SonsAndBrothers, a campaign to help uplift young people of color; building out the first ever #ImmigrantHeritageMonth; to being the Senior Creative Director of SOZE. Jasmine Reign: This is your friend, so you know how best to address them. Keep in mind that unfortunately, it’s often far more likely that people will respond to hostility with hostility. Sometimes though, you have to get people in Formation and let them know that they can’t just act wild without consequences. Do that if you need to. 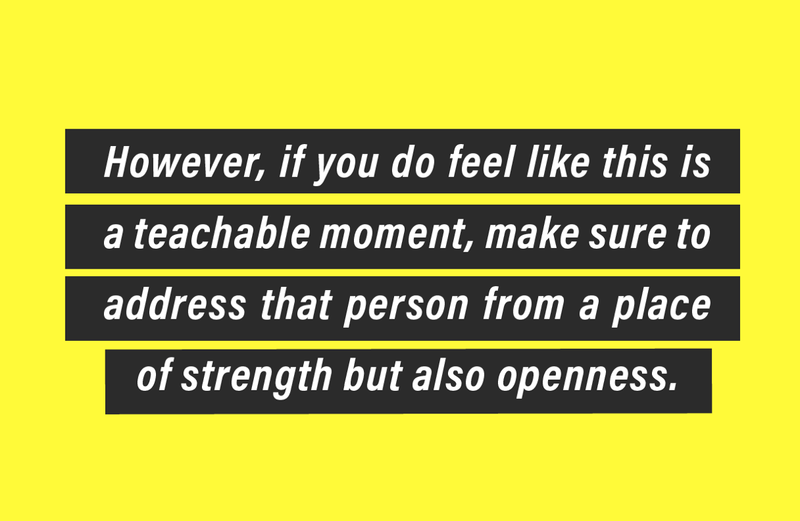 However if you do feel like this is a teachable moment, make sure to address that person from a place of strength but also openness. Something like “That was totally inappropriate, and really offensive. Why did you think it was okay to say that?”might begin a conversation, but then again it might not. Since these are friends, the likelihood is that it will. If you are met with, “well, you know, you’re not like that…” or, “you know I don’t feel that way about you…” it’s time for a quick lesson about minority politics. Namely, that when someone gives power to a stereotype it affects you, even if they don’t think it does. Because a stereotype only has as much power as our social discourse gives it, and every time they buy into it, in whatever capacity, they give it more power. 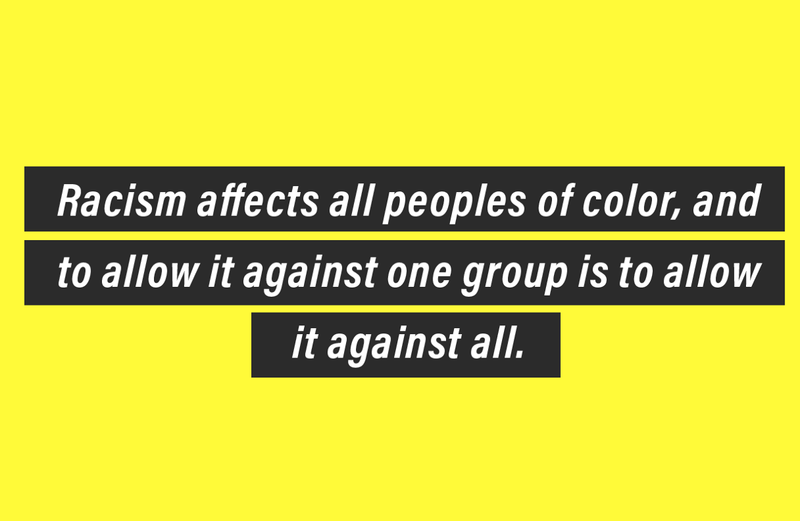 Racism affects all peoples of color, and to allow it against one group is to allow it against all. Hold your friends accountable for the things that they say, whether or not they’re against you, point blank period. If you are a person of color, making a prejudiced statement against another person of color: WTF ARE YOU DOING DUDE? Congratulations, you played yourself. We all have a role in ending racism. Before you can take yours, do a mental check of what’s realistic, and go from there. Focus on the microaggression, not the person. No one wants to be labeled a racist. Being called out can make people feel defensive, and less open to hear what you’re saying. Kyle Casey Chu is a Queer Chinese American musician and media activist.